Here at SCRABEL we have several 3D printers which are examples of fused filament fabrication (FFF) also known as fused deposition modelling (FDM) printers. These are ideal for creating prototypes relatively rapidly and cheaply and works by heating a “filament” (in our case, Poly Lactic Acid – PLA) which is then deposited in layers onto a stage where it cools and hardens. As the printer deposits more layers the model gradually grows up from the stage. To print a 3D cube we first need to tell the printer what a cube looks like, so we use CAD (computer aided design) software to draw a cube and generate a .stl file. The .stl file is then opened in a programme to translate the .stl file into a G-code (a language that the printer can understand), here we use a programme called slic3r which is freeware available for online download and shows the size of the 3D model relative to the size of the stage, allowing re-scaling at this point. The G-code tells the printer how to print the layers to end up with the best representation of the desired model. The G-code is then loaded on a third and final piece of software called Pronterface (which is the software open on the PC in the video) – it tells the printer when to print, gives an estimated finish time, and displays how much of the model has been printed in real time. When we begin printing, depending on the exact printer the manufacturer may specify an adhesive to use on the printing stage so that when the first layer is deposited it sticks to the glass surface, preventing warping as the PLA cools; here I’ve used some hairspray before instructing the printer to begin. In this example the stage is heated to 40°C and the filament to 190°C before the printer begins deposition, however these settings will be different for different printers and materials though the general principles are much the same. The nozzle, or extruder, is moved side to side while the stage takes charge of forward and back motions. Whenever we print anything here we command the printer to lay down an ‘outline’ to ensure that the PLA filament is heated to the right consistency and is flowing properly before commencing construction of the model. As you can see (hopefully!) the heated filament is fed through the extruder where it is printed in successive layers onto the stage – the PLA cools quite quickly when deposited in thin layers so the structure is strong enough to support itself during printing. When designing a model it’s important to consider which side of the object is going to be against the stage to make the model as stable as possible – for example, constructing the pyramids of Giza upside down would be a heck of a job, and they’d fall over anyway. I’m exaggerating with some artistic licence but the principle is the same when it comes to thinking of printing in successive layers, printing from a large base to a point would be possible, whereas printing from a point and gradually increasing to a pyramid wouldn’t work as the foundation layers are not strong enough to support the growing structure and the soft PLA will sag, unsupported. To save on materials, instead of printing a solid block of plastic it creates a lattice structure in the middle of the object rather than filling it completely – this can be changed if more stability is required but is ideal for quickly and cheaply producing prototypes. Printing was paused on construction of a second cube to show the internal structure of the cube, see below photo. 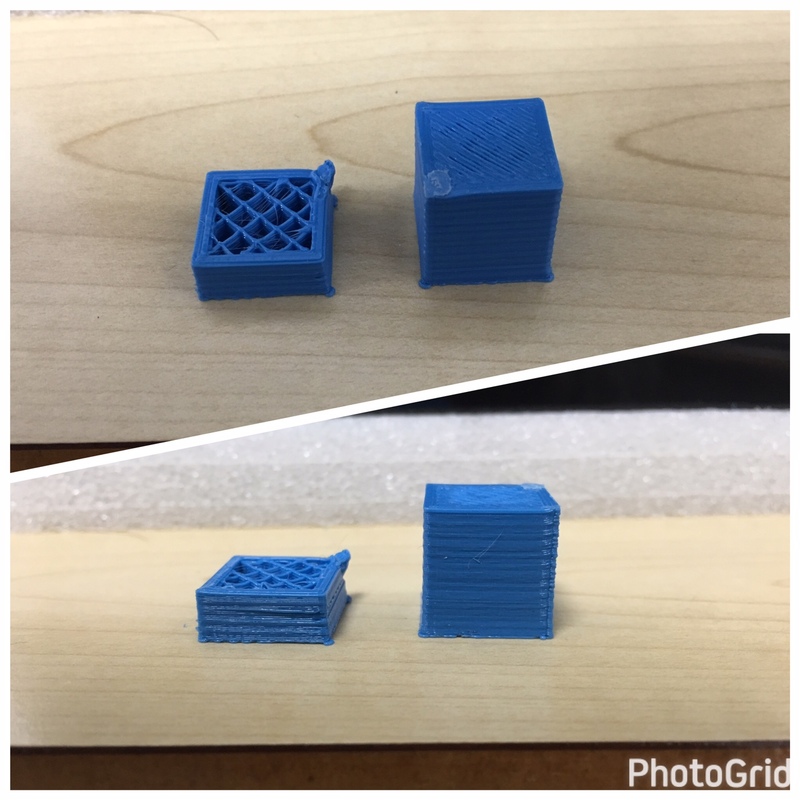 Example of cubes printed on our 3D printer here at the SCRABEL. The cube on the left was stopped partway during the printing process to expose the internal lattice structure. As you can see, the 3D printer cross-hatches the interior of a solid shape – maintaining stability while minimising any waste of material. You can see in the corner where the extruder dripped a little as it was still hot when stopped and also the lamination (layering) on the sides of the cube. Different printers can improve the resolution of models, resulting in less obvious lamination, however for our purposes of prototype creation these are ideal. Here in the SCRABEL we have a general aim to reduce the cost of clinical processes to increase availability of medical treatments for those who need them, as such we strive to be as cost-effective as possible, especially when mocking up ideas. Once the model is complete, the filament and stage cool down automatically and the model can be removed. Of course, a cube was a quick example to show the key principles of the instrument, but the range of applications for this instrument are so vast that it really is true – if you can dream it, you can print it. Collage of some of the items printed here in the SCRABEL- quite a range as you can see. 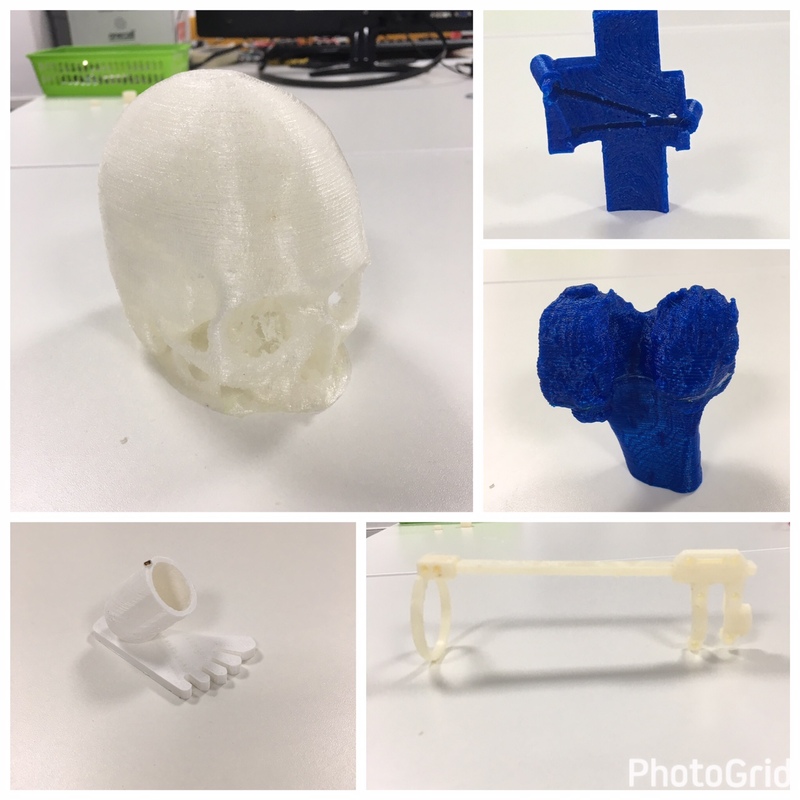 Top left = skull; top right = surgical jig; middle right = model of a patient’s arthritic knee; bottom left = replacement foot custom made for an ironing board; bottom right = retinal imaging adapter to fit a smartphone developed by Shieng Chong Hong and freely available online here.